Professor Muhammad Yunus, popularly known as “Banker to the Poor”, is a Bangladeshi economist, Nobel Prize winner and pioneer in the field of microcredit. He is known for founding the acclaimed Grameen Bank in 1983. 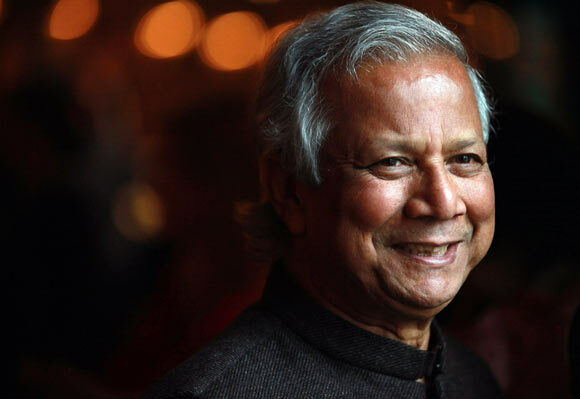 Yunus was born in 1940 in a village in Chittagong. Yunus was an active Scout during his school years and travelled extensively to West Pakistan, Europe, USA, India, Canada, Japan and Philippines to attend Scout meetings. He received his B.A. and M.A. in Economics from Dhaka University in 1960 and 1961 respectively, where he taught for four years after his graduation. Having been offered a Fulbright Scholarship in 1695, Yunus chose to acquire a PhD from Vanderbilt University in the U.S., which he received in 1969. In the 1970’s, he promoted the cause of Bangladesh’s independence from Pakistan by mobilizing Bangladeshis living in the U.S. He established newsletters and ran the Bangladesh Information Center in Washington D.C. to lobby the U.S. Congress to curb military aid to Pakistan. After Bangladesh attained independence in 1972, Dr. Yunus decided to move back home to show support for the newly formed nation. He joined the Economics Department of University of Chittagong. Muhammad Yunus was struck with the wretched poverty of the working class. A famine in the year 1974 worsened the situation, which led Yunus to establish the Rural Economics Programme on behalf of the University. In 1976, during a visit to a poor village, Yunus pondered that a small loan to an abjectly poor person could make a huge impact on their lives. Poor people had no sound means of borrowing and the only sources available to them charged enormous interest, which effectively took away all their profits. He personally financed the loans of 42 people in the village by giving them a nominal sum of around $30. He took his ideas of financing the poor to traditional banks but was met with rejection as the poor were not considered creditworthy. Undeterred by these rejections, Yunus managed to secure a line of credit from Janta Bank in 1976, offering himself as the guarantor. He started making loans to poor people, particularly women, and met with instant success. In 1983, Professor Yunus formally set up his own bank by the name of Grameen Bank (which translates into Village Bank). Contrary to popular belief, Yunus was convinced that the poor were the most creditworthy; a fact which has been proved by Grameen’s Bank outstanding record of more than 96% loan recovery. A vast majority (approx 97%) of borrowers were women entrepreneurs. The effectiveness of the Grameen Bank model has gained worldwide acclaim and roughly 100 countries now follow this model of microcredit. Today the Bank has more than 2500 branches in Bangladesh, almost 20,000 staff strength, and a customer base of more than 8 million people. In 2006, Professor Yunus was awarded the Nobel Peace Prize for his outstanding services for the eradication of poverty, which he shared with his company. Grameen Bank is the only company, and Professor Yunus the first Bangladeshi national, to win the Nobel Prize. Professor Yunus has also established several other companies in Bangladesh, including telecom, energy, social venture capital, textile, fisheries, livestock, food etc. He has received numerous other awards and honors, such as being chosen one of “The 25 Most Influential Business Persons of the Past 25 Years” by Wharton School of Business, being second on the list of Top 100 Public Intellectuals in US and UK magazines, the World Food Prize, Sydney Peace Prize, several Bangladesh government awards and induction into the Legion d’Honneur by President Chirac of France and several humanitarian awards. Professor Muhammad Yunus has written many books, two of which were New York Times Bestsellers.